It is often said of Histoire(s) du cinéma that its main “character” is Adolph Hitler, due to the frequency with which the man is invoked throughout Godard’s opus. In the same way, if the recent writings of Jonathan Rosenbaum have a central protagonist, then in his case it is George W. Bush. The Chicago-based writer has always infused his passionate advocacy of marginalised filmmaking with a heavy dose of radical opposition to the conservative status quo governing US politics, such that fellow critic Howard Hampton could joke that “Rosenbaum’s solution to the problem of the homeless and orphaned movies would be to bring them together, housing the poor in theatres holding all-night Jacques Rivette screenings” (and to his credit Rosenbaum quotes this line on p. 212 of Movie Wars). But after Bush’s victory in the 2000 election, this mixture took on a highly individualised tinge, as the Republican president became, for Rosenbaum as for much of the US left, a personal avatar of the right-wing turn the country had made, which devastated the American cultural scene as much as it escalated social inequality. Leafing through his latest collection, the reader would not be surprised to stumble across a passage directly blaming Bush for the closure of a local arthouse cinema. 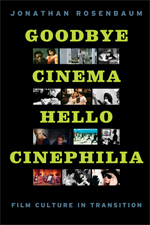 The title Goodbye Cinema, Hello Cinephilia: Film Culture in Transition might lead us to expect Rosenbaum’s new offering to be a foray into longer-form writing, giving an in-depth analysis of the fundamental shifts currently taking place in the manner in which films are made and consumed. Instead, Rosenbaum repeats the modus operandi of Placing Movies and Movies as Politics: gathering shorter pieces – some of which date back to his early writings in the 1960s and 70s, but which were predominantly written since the turn of the century – and thus giving the compilation a vaster, more multifaceted scope than the title would imply. It is left, therefore, to the anthology’s introduction and eponymous opening article to address this specific question, before Rosenbaum wheels off in numerous different directions. As such, from the very first lines of the book, Rosenbaum sets out his Zeitdiagnose: “It’s a strange paradox that about half of my friends and colleagues think that we’re currently approaching the end of cinema as an art form and the end of film criticism as a serious activity, while the other half believe that we’re enjoying some form of exciting resurgence and renaissance in both areas.” (ix) This is at least partly ascribed to generational difference, but more pertinent is the fact that “people nowadays don’t always mean the same things when they use terms like ‘cinema’, ‘film’, ‘movie’, ‘film criticism’, and even ‘available’ – terms whose timeframes, experiences and practical applications are no longer necessarily compatible.” (xii) Rosenbaum traces what is perhaps the most seismic shift in contemporary cinephilic culture: the phenomenon of clandestinely distributing films through the Internet. Previously inaccessible films, the evocation of which had been Rosenbaum’s stock in trade, can now be downloaded with ease, but their changed conditions of viewing should lead us to interrogate to what extent we can identify them with the original work. This, indeed, is what the writer attempts, but the suggestion by the title that a productive era of “cinema” is ceding to a period marked by the cinephilic appreciation of past glories, primarily through watching DVDs or Internet-downloads, is one which Rosenbaum studiously evades. Instead, he is content to explore the paradoxes of this transitional moment – while reminding us that film culture has always been in transition – without providing the reader with a firm thesis one way or the other. Of course, nothing else should be expected from a writer who has cultivated a mercurial, refreshingly anti-academic position while refusing to succumb to the PR-steered journalistic film writing he so frequently fulminates against. And so Rosenbaum continues his scattergun approach to anthologising his articles: grouped under the deliberately vague headings: “Position Papers”, “Actors, Actors-Writers-Directors, Filmmakers”, “Films” and “Criticism”, there is no immediately apparent justification for the selection or order of any of the pieces. By the same token, however, a lot of the book is familiar territory for Rosenbaum aficionados: the reader is cocooned in a well-worn narrative of confrontation between the tireless efforts of genuinely creative, groundbreaking filmmakers (with Rivette, Welles, Portabella, Tati and Stroheim among others) and the equally tireless forces of late capitalism to obfuscate, contort, sully and repress their output. There is a conspiratorial side to Rosenbaum’s writings – no wonder the affection for Rivette – wherein the inclusion of the studio edit of a film on a DVD release becomes part of a totalising programme of cultural control, and the chosen weapons of resistance are a multi-region DVD player and a frequently updated blog (it is indicative that Rosenbaum has repeatedly stated that he lives more on the internet than in Chicago). This reaches a highpoint with the 2009 article “Bushwhacked Cinema”, which intimates at connections between the Bush administration and the advent of the iPod, or the Saw series and Abu Ghraib, and one even feels that Rosenbaum needs to take on the mantle of lone combatant against the dark powers of barbarism in order to give impetus to his writing. Discussing recent DVD releases of Chaplin films, for instance, he makes the astonishing claim that the filmmaker has “suffered from an almost continuous critical backlash in the seventy-odd years since [the 1930s],” (90) and this attitude permeates the bulk of his discussions of filmmakers, whether their status as neglected master is deserved or not. This should not overly detract from a work by one of the most insightful critics writing in English today, whose true highlight is the last section, when Rosenbaum largely abandons his crusading mission and turns to fellow film-thinkers such as Daney, Sontag, Moullet, Farber and Sarris, who have, variously, served as inspirations, models, rivals and adversaries to Rosenbaum himself. The result is a much more polyphonic experience than the rest of the collection, as other critical voices make themselves heard: the most startling example of this being the article on and with Raymond Durgnat, where the late British critic acerbically responds paragraph by paragraph to Rosenbaum’s claims about him. Goodbye Cinema, Hello Cinephilia may not be a thorough analysis of the changes in film culture, but what leaps out is its status as a symptomatic register of the transformation of film criticism in the last few years, not only in what is discussed (the extras in DVD packages as much as the films themselves) but also in the organs in which they are discussed (blogs, websites, DVD liner notes as much as film journals and daily newspapers). Indeed, the idea that these different forums have equal legitimacy as vessels for critical thought may be Rosenbaum’s lasting legacy.